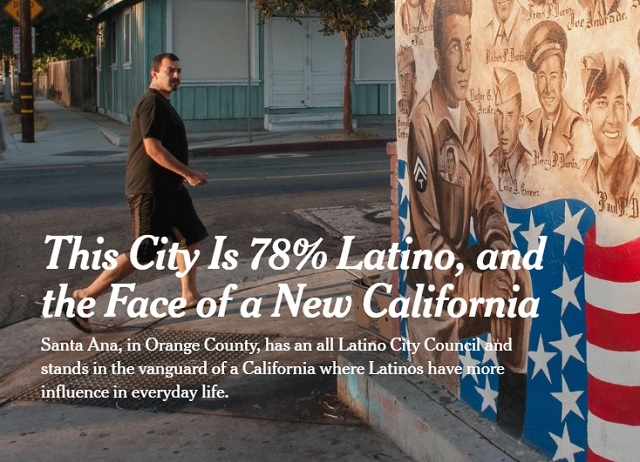 Contrast the article with another from the NY Times from 2016 celebrating Santa Ana in Orange County as the “vanguard” of a “New California” for becoming 78% Latino. White people are a majority in New Hampshire: here’s why that’s a problem. MANCHESTER, N.H. — Catalina Celentano used to hold training sessions for hospital workers in Lynn, Mass., to familiarize them with the cultures of patients from Cambodia, Russia and the Dominican Republic. When she moved to New Hampshire, she suddenly found herself in an ethnic vacuum. The power and presence of Latinos in this community in Orange County — itself once a bastion of Republicanism — is echoed up and down the California coast. Latinos now make up just under 40 percent of the state’s population, projected to increase to 47 percent by 2050. The leaders of both houses of the Legislature are Latino, as is the secretary of state, the current mayor of Los Angeles and the previous mayor. The need to “diversify” the city was not raised, in fact, the word “diversity” didn’t appear once in the entire article.